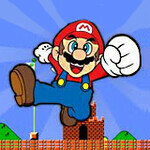 This awesome Super Bros platform jump and run adventure game is not only advisable for Mario or Luigi fans! Use the arrow keys, Z, X and C to explore the world. Use your arrow keys to play this free online flash game.